Samuel Matlack purchased the slightly over fifteen acres known as Camp Dark Waters in 1927. 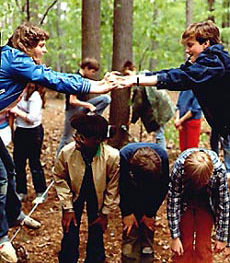 The camp was offered to the Friends First Day School Association for the use of boys and girls of Philadelphia Yearly Meeting and their friends. The first year of camp, tuition was $20 for two weeks, and cost that went down to $15 in 1929! At the end of the thirties Sam Matlack rented the camp to a Quaker family, John and Betty Parker. They were running another camp, Camp Onas at the time and organized a plan whereby boys started out the summer at Dark Waters while girls went to Onas. In the middle of the summer, they switched. 1952 brough a change in management as Wilbert and Nina Braxton became directors. They oversaw the clearing of the softball field, needed to play group sports and games, for the 1957 season. Steve and Micky Edgerton took over the camp in 1963. His leadership saw many fascilities improvements, as well as the achievment of American Camping Association (ACA) certification in 1977. In January of 2001, a group of former campers and staff along with neighbors and other friends of the camp formed a Not-For-Profit organization and purchased the camp from Steve. 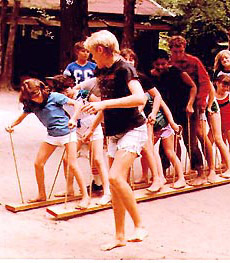 Travis Simmons had been the Resident Director during the summer of 2000 and upon Steve’s recomendation, the new Board of Directors hired him to become Camp Dark Waters’ first year-round, full time employee. See the text of the first brochure for Camp Dark Waters (1928). You can learn more about the history of the Arapahoe Cabin. It was built in 1899 and many fine outdoorsmen of the day stayed there for nearly 30 years before CDW began!